Last Friday I got my assignment for the 2005 Screenwriter's Challenge. The Screenwriter's Challenge is a short screenplay contest that puts people in heats with the same genre and subject matter - everyone has one week to write a 20 page max script. I got Comedy: Lost Luggage. Didn't really like any ideas I came up with during the week, so ended up spending no more than a couple hours on it over the week. Friday night I finally decided to buckle down and finish something. My final script went into the mail this morning with 10 minutes to spare before the post office closed. It is called Baggage Profilers and its 12 pages long. The log line is; In the War on Terror everybody and everything has a role to play, even lost luggage. I still don't like it and I don't see it getting on to the second round - that is writing a short script in just 24 hours. But my goal was just to finish, and I did - Yay! To celebrate Lori and I went on a 6.5 mile bike ride. Sure that might be no big whoop to you, but this was the first time on my bike in three years. It is part of our Amazing Race training. Then I decided to send flowers to myself. "Since suffering a mild stroke on Feb. 16, 2005, Tedy Bruschi has focused on the short-term goal of getting better every day. His health has improved steadily during the past five months and Tedy continues to make daily improvements with his on-going rehabilitation. It has been an offseason of many emotional highs and lows for Tedy and his family. With the Patriots' training camp reporting date now just over a week away, Tedy has reached a decision on his playing status for the upcoming season and has declared his intentions to forgo the 2005 campaign. 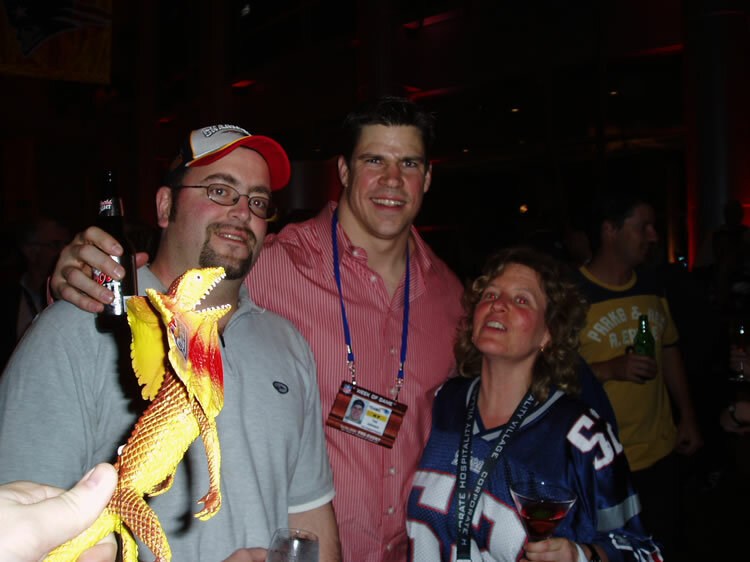 "The Bruschi family wanted to express their heartfelt appreciation for the tremendous outpouring of support they have received from fans throughout New England and others around the country. They also expressed their gratitude for the support and assistance provided by the entire Patriots organization. Tedy pledges to focus on his health and his family while continuing to offer on-going support to his teammates throughout the upcoming season." Bruschi had been working out for much of the offseason at Gillette Stadium and was at last month's mini-camp, participating in the meetings, but did not in any on-field work. All this lead to plenty of speculation and hope that he was planning to return. Nothing has been said regarding plans beyond this season or if will have any sort of new role with the team for this season. Lori and I have long been fans of The Amazing Race and have talked about trying out for it. Well, we finally followed through - our applications and video tape were mailed in this morning. Now we just wait. Ohio? Yes Ohio! Because of Cedar Point - an absolutely insane amusement park on the shore of Lake Eerie in Sandusky Ohio. Cedar Point has been named "Best Amusement Park in the World" for the last 7 years and they have the most roller coasters in the world - 16. Plus a new thrill ride for 2005 - MaXair, which is sort of spinning pendulum of death. And since we are waiting until October it will be a Haunted Park! Sick!! Got the DVD of Sideways for my birthday and it has one of the best commentary tracks I've ever heard. The commentary by lead actors Paul Giamatti and Thomas Hayden Church was funnier than the movie. Definitely worth checking out. Live 8 is already underway. Television coverage doesn't start until Noon on MTV and VH1, and ABC will have highlights tonight from 8 - 10pm. You can see it all live from around the world at http://music.aol.com/. I'd say the biggest thing I'm looking forward to is to the reunited Pink Floyd, but I'm sure there will be lots of surprises through out the day.